Just over the red April 25 Bridge (Ponte 25 de Abril) from Lisbon lies the Costa da Caparica, a strip of coastline stretching for about 19 miles (30 kilometers) from the bridge down to Arrabida Natural Park (Parque Natural da Arrábida). In summer, the beaches are packed with locals soaking up the sun and surfers looking to catch a wave. Costa da Caparica comprises a number of beaches, each with its own vibe and each beloved by Lisboans and visitors alike. From the party atmosphere of Caparica town beach to the more laid-back Morena Beach (Praia da Morena) to Lisbon’s original nudist Meco Beach (Praia do Meco), there’s something for everyone along the coast. Tours to Costa da Caparica generally involve surf lessons or bodyboarding, as the waves here are perfect for beginners. There are coastal horseback-riding tours from Lisbon, as well. For those who want to explore the entire coast, beach-hopping tours are available in summer. Costa da Caparica is a must for beach lovers and beginner surfers. Some beaches have limited facilities while others have beach bars serving Portuguese fare, snacks, and drinks. There is little shade along the coast, so wear plenty of sunscreen and rent or bring a beach umbrella. The easiest way to reach Costa da Caparica from Lisbon is by car or taxi. Alternatively, take the private TST bus 153 from Praça de Espanha or 161 from Praça do Areeiro, or hop the 5-minute ferry from Cais do Sodré to Cacilhas and get bus 135 from there. Once on the coast, a mini-train runs 6 miles (9.5 kilometers) from Caparica to the less-crowded beaches farther south. The best time to visit Costa da Caparica is during summer, when the weather is hot and the cold Atlantic water is refreshing. If you want to surf, arrive early in the day for the best waves and the fewest people vying for them. While Costa da Caparica is known for its beaches, there are also a few historical locations to explore. A 16th-century monastery overlooks the town of Caparica, and farther south you can find the Arriba Fóssil da Costa da Caparica, a nature reserve where 15-million-year-old fossils have been discovered. Other notable points include the estates of Medos (Quinta dos Medos) and São Miguel (Quinta de São Miguel), the residence of Robert Gulbenkian, and the rock-and-limestone House of the Crown (Casa da Coroa). Get a deeper insight into the true culinary and typical Portuguese cuisine during a cooking class and an excursion to the local market selling Fish Meat fruits and vegetables. A practical experience designed for lovers of gastronomy, this tour allows you to explore Portuguese cuisine in more depth than simply eating in restaurants. Choose fresh ingredients from a list that we will provide and buy in a local market the ingredients that will prepare and delight in the fruits of your work - You can choose to learn how to cook the famous fish stew or fish like Caldeirada or Grilling Pork (Entremeada, Black Pork, Chorizo). Recipes are provided by email after class, ensuring that you can also recreate Portuguese dishes at home.Lunch will be prepared and eaten inside the market where you will have the opportunity to share your experience with the friendly local people who will help you in everything that is necessary.All experience will be overseen by an expert guide and properly prepared. This unique experience will offer a magnificent aerial view of some of the main Lisbon touristic and historic hotspots. After checking in and the safety briefing you will board the helicopter and take off on a flight over the Tagus River. During the flight we will have a sight of the city and especially the following hotspots : Belém Tower , Discoveries Monument , Jeronimos Monastery , the Electricity Museum , the MAAT Exhibition building with is wave shape. Once arrived at the 25Th April Bridge you will have a close view of the Christ King Monument with is arms opened to the city and to all Lisbon visitors and after you will return to the heliport - facing the Tagus estuary , and flying over the Caparica beaches -where you will land close to Port Authority Control Tower a Pritzker Architectural Award. You will fly over the site from where the Portuguese Discovers sailed to discover new routes to other continents,. 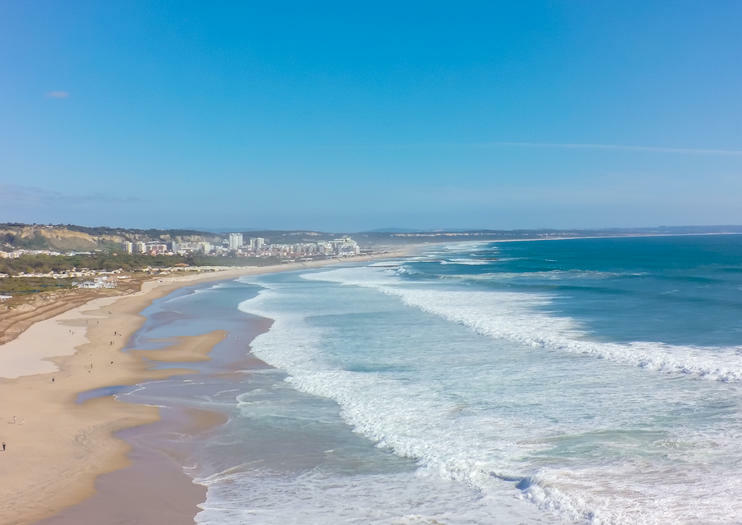 The Costa da Caparica is home to some of Portugal’s most beautiful beaches, but getting there by public transport can be tricky for visitors. This one-way shuttle bus from Lisbon ensures a hassle-free transfer, so you can spend as long as you like swimming, surfing, or sunbathing at a beach of your choice. Get acquainted with the stunning natural landscapes surrounding Lisbon during a horseback ride to Costa de Caparica. After strolling past the colossal Fossil Cliffs, you’ll climb atop a horse and canter past stunning coastal scenery. Stop to relax on the powdery sands of a local beach and opt to enjoy traditional Portuguese dishes such as grilled sardines and baked fish. On this small-group tour — limited to six people — you’ll receive personalized attention from your guide. Escape the city center in favor of sea breezes and rolling hills on this e-bike tour of Trafaria and Costa da Caparica from Lisbon. Cruise along the Atlantic coast on easy-to-ride electric bikes—little pedaling ins required, so you can cover more ground with less effort. As you cruise through rural landscapes and charming fishing villages, your guide fills you in on local history and culture. Venture over the famous April 25th Bridge and explore the landmarks of Almada and Costa da Caparica on a private tour. Take in the views of Lisbon from the Christ monument; tour the elegant Cerca House from the 12th century; walk on the hull of the 19th-century Dom Fernando and Gloria Frigate; explore the Capuchin Convent; and stroll the beaches of Costa da Caparica before heading back to Lisbon. See Lisbon from a whole new perspective on this full-day guided tour. Meet your knowledgeable local guide in a central location and set off to explore a unique area of Portugal’s capital. Make your way along Old Alfama, with views of the Tagus River, as your guide tells you about the Age of Discovery and other important times in Portuguese history. See Cacilhas, Almada, Costa da Caparica and more. You especially won’t want to miss the Cristo-Rei monument.